Wisdom of Life. : Has love got jealousy??? Sweet young thing (SYT) asked, "Has love got jealousy?" Yes! A little jealousy is normal but definitely not too much. A little jealousy indicates the lovers have concern for each other. 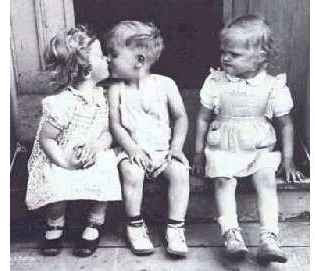 Jealousy is unavoidable because emotion is also uncontrollable in every one of us. However when one party who cannot control this jealousy emotion, this particular lover might turn love into hate or tend to be possessive in their relationship. Hate in turn could lead to many unhappy behaviours and too possessive in love could be unpleasant as well. The only way to overcome hate and possessiveness, is Trust. Unless you have the patience and tolerance, Trust would not be developed. So! When you have trust, you eliminate the emotion of jealousy in love. I warned SYT, when you have no jealousy over your love, it means you no longer love your partner too. Meaning, when you don't like and love your mate any more, you naturally won't be bother with him. Care and concern is out in your mind. So! You still need a little jealousy to maintain a good love relationship. You have to buy a 'love's barometer' to determine your jealousy level. So when it shows you are at a dangerous level, you better come to read my Wisdom of Life again. Food for thought - "Love sees sharply, hatred sees even more sharp, but Jealousy sees the sharpest for it is love and hate at the same time" - Arab Proverb quotes. Didn't see you around lately. Good to hear from this sweet lady again. Nobody on earth could control anger, unless that person isn't normal. Me! Oh not easy for me either my dear. But I have a special arrangement with little darling, that whenever we have quarrel or argument, we won't carry forward our anger over night. Either one of us has to give way and say sorry. And normally I would touch her first coz she is very important to me and I can't lose her. It works well and I suggest you should try this approach too. consitderation of easy and after all Jealosy Quotes easy for me either my dear. But I have a special arrangement with little darling, that whenever we have quarrel or argument, we won't carry forward our anger over night. Either one of us has to give way and say sorry. And normally I would touch her first coz she is very important to me and I can't lose her. You sounded like a friend to me. thank you :) always welcome..!! The best way to win over an argument and not getting angry, is to keep silence. Because all words utter while you are angry, are hurting words. Moral indignation is Jealosy with a halo.